What a beauty! This beautiful, well kept villa in the Cabanyes district is in a very well maintained, fenced location where the children can play to their heart's content. For example In the slightly lower private pool or in the garden. You lie tanning on a sun lounger on the sun terrace surrounding the pool. For some shade go to the covered terrace with seating, you will enjoy a beautiful view over the green hills of the nature reserve of Les Gavarres. In this area you can make beautiful walks and go cycling, there are many routes. 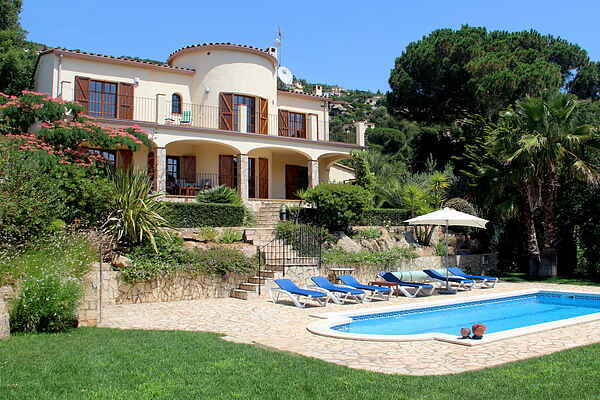 Scenic drives are also a must as you are located in a beautiful part of the Costa Brava. The nearest beach is that of Sant Antoni de Calonge (3.5 km). Drive 5 km further and you are on the beach of the famous Platja d'Aro. But the beautiful 'Costa Brava beaches' are not far; beyond Palamós (8 km) are the beautiful coves of La Fosca and Castell (about 10 km) and a little further are the charming fishing villages Llafranch and Calella de Palafrugel (19 km), all highly recommended! Platja d'Aro is home to the Aquadiver water park, the golf course of Mas Nou and there is a market every Friday.